The Law Commission today began its consultation on simplifying the Immigration Rules. You can access the consultation paper here. If you wish to respond to the consultation, you have until 26 April 2019 to do so. The Law Commission says its consultation aims to provide a more logical structure to the Immigration Rules, remove unnecessary repetitions and improve their drafting. As the summary document accompanying the consultation paper notes, "[a]s of December 2018, the Rules had reached 1,133 pages in length. They have approximately quadrupled in length in the last ten years. Statements of changes to the Rules are frequent and detailed. The Rules are widely criticised, including by senior members of the judiciary, for being poorly drafted. The structure of the Rules is confusing and the numbering system is inconsistent. There is duplication between categories of application and repetition or near-repetition within categories. In addition, there is a large volume of material which supplements and supports the Rules. The relationship between this material and the Rules is complex." In 2013, Lord Justice Jackson described the Rules as having "now achieved a degree of complexity which even the Byzantine Emperors would have envied", while Lord Justice Irwin said in a speech last year that they were "something of a disgrace". The Law Commission says it is aiming to determine the causes of underlying complexity in the Rules in order to provide workable proposals for their simplification and make them clear, comprehensible, and organised in a way which is suitable to the needs of users. The Law Commission hopes this will increase transparency for applicants and lead to quicker decision-making by Home Office caseworkers. The main consultation paper explains: "In this paper we seek the views of consultees first on the pros and cons of reducing prescription in the Rules, or in some parts of the Rules, by reverting to a structure of more general rules supported by non-exhaustive or illustrative guidance which is not mandatory. Next, we seek views on the creation of a more user-friendly product through the reorganisation of the structure of the Rules. We then consider possible improvements to the internal organisation of the Parts of the Rules, and provisionally propose a new approach to drafting style, on which we seek views. We also present an illustrative re-draft of two portions of the Rules and seek comments on them." "We also seek views on possible ways of maintaining simplicity once achieved, and approaches to the archiving of previous versions of the Rules. We conclude with consideration of the experience of applicants in accessing the Rules and a review of the technological advances which are already changing how the Rules are accessed. We seek views on how these could be harnessed to provide a clearer route map for applicants and to help them to navigate the appropriate eligibility requirements." An audit of overlapping provisions within the Rules. Where possible, a standardisation of wording could be introduced to reduce the possibility of confusion. Considering the frequency of changes. To ask whether, except in urgent cases, changes to Rules should be made on two common commencement dates a year. A uniform approach to the organisation of the Rules and drafting style, including with regard to headings, the inclusion of definitions and section numbering. Ensuring that simplification is maintained in years to come by keeping the Rules under review, and improving how amendments are presented and earlier versions of the Rules archived. Investigating whether technology could improve an applicant's experience, for example: through the online presentation of the Rules including an initial route map, hyperlinks and signposting; and by using interactive tools to guide them through the application process and alert them if the application is defective in any way. Online tools might be created to sequence the exact set of Rules which apply to an applicant. Nicholas Paines QC, the Law Commissioner for Public Law, said: "As the Immigration Rules have become longer, more detailed and more specific, they've also become more complicated and harder to follow for applicants. "The Home Office has asked us to help put things right. Our proposals would introduce clearer language, and improve the presentation of the Rules so they're easier to understand and follow. 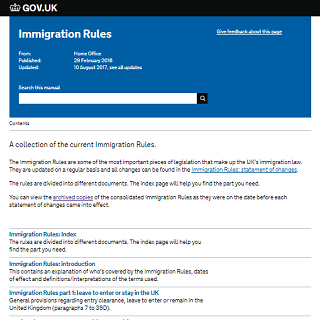 "We seek the public's views on how to make the Immigration Rules simpler and more accessible."